stop! Don’t panic. We can sort this out together. Please allow Grantland to be your mine-sniffing dog. • It’d be one thing if the Coen Brothers were doing this to jump-start themselves out of some atypical rut in their career. But the power duo is chugging right along: They’re coming off the truly great True Grit, which copped a weighty ten Oscar nominations, and they’ve got Inside Llewyn Davis, which revolves around New York’s folk scene in the ’60s, up next. 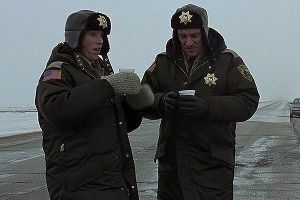 Now take into consideration that there was a 2003 attempt at a Fargo show (it starred Edie Falco and was directed by Kathy Bates, and it didn’t get past a pilot), which was undertaken without the Coens. Is it possible the bros have been itching to get their own crack at this thing for the better part of a decade? FX stays winning. Maybe some of you would feel better if Fargo TV was going to HBO or Showtime. But FX — a.k.a. “a smart jerk with annoyingly excellent taste,” says the The New Yorker — has my trust. • Your head writer is a fellow by the name of Noah Hawley, who worked on Bones and has created two short-lived series: The Unusuals, a goofy NYC cop show which starred Amber Tamblyn and a pre–Hurt Locker Jeremy Renner, and lasted 10 episodes, and My Generation, a high school reunion comedy which died after just two. Noah Hawley may certainly be a super-talented guy who just hasn’t broken through yet; he keeps getting jobs, doesn’t he? But as far as imbuing us with confidence, his name alone doesn’t quite work. • This Fargo adaptation certainly feels a bit random, does it not? Here’s maybe why it’s happening now, according to Deadline: “The title belongs to MGM’s library, making the project part of MGM TV’s strategy to mine the company’s catalogs for properties suitable for series adaptations/remakes. The company has the Teen Wolf reboot on MTV and recently announced [a reboot of] Fame.” Teen Wolf! Fame! Fargo! Ugh, ugh, ugh. And so, in conclusion: I don’t know, man. Maybe it’ll be good?! Grading the Charts in ... COUNTRY MUSIC!